studied Industrial Engineering at the Berlin University of Technology. During his studies, he had study visits at the MIT in Boston, USA and at the University of Grenoble, France (maîtrise en sciences économique). In 1987, he was promoted to the Department of Logistics of the TU Berlin (Prof. Dr.-Ing. H. Baumgarten). Frank Straube led logistics projects at the TU Berlin and in practice from 1984-89. From 1990, he became CEO of an international planning company, Zentrum für Logistik und Unternehmenssplanung GmbH. Prof. Straube has been a permanent guest professor at the University of Pantheon-Assas Paris since 2003. 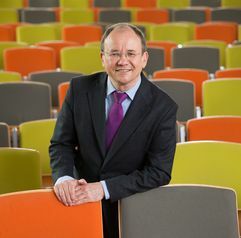 After his habilitation (2003) at the University of St. Gallen, he became Chairman of the Board of the Kuehne Institute for Logistics at the University of St. Gallen. In October 2004 he followed the call to the TU Berlin and has been Head of Logistics at the Institute of Technology and Management since then. In addition to the management of the Logistics Department, Frank Straube is Prodekan and a member of the faculty council of the Faculty of Business & Management as well as the Institute Council and the Joint Commission for the Degree Course in Industrial Engineering (GKWi) at the TU Berlin. In 2008, Prof. Straube contributed to the establishment of the Chair of International Logistics Networks and Services, sponsored by the Kuehne Foundation at the Chinese-German College for Postgraduate Studies (CDHK) at the Tongji University of Shanghai, and has been a permanent guest professor since then. Since 2009, a cooperation with the Abu Dhabi University has been under the direction of Frank Straube. Prof. Straube is a member of the Advisory Board of the German Logistics Association (BVL) and was a member of the Executive Board from 1997 until 2009. He is also Chairman of the Advisory Board of the BLG LOGISTICS GROUP, as well as in various supervisory and advisory boards of nameable companies. Prof. Straube is the founder of the International Transfer Center for Logistics (ITCL) for the realization of innovative planning and further education activities for companies. He is also a member of the World Bank's Global Expert Knowledge Network and the Board of Trustees of the Kuehne Logistics University in Hamburg. Frank Straube is also deputy chairman of the jury of the DB Schenker Award of the Deutsche Bahn Foundation. He is on the editorial board for international scientific journals, on the board of the “Association Internationales de la Recherche en Logistique et Supply Chain Management” (AIRL) and on the Scientific Committee of the Global Conference on Sustainable Manufacturing. He is a member of the board of the “Rencontres Internationales de la Recherche en Logistique” (RIRL).